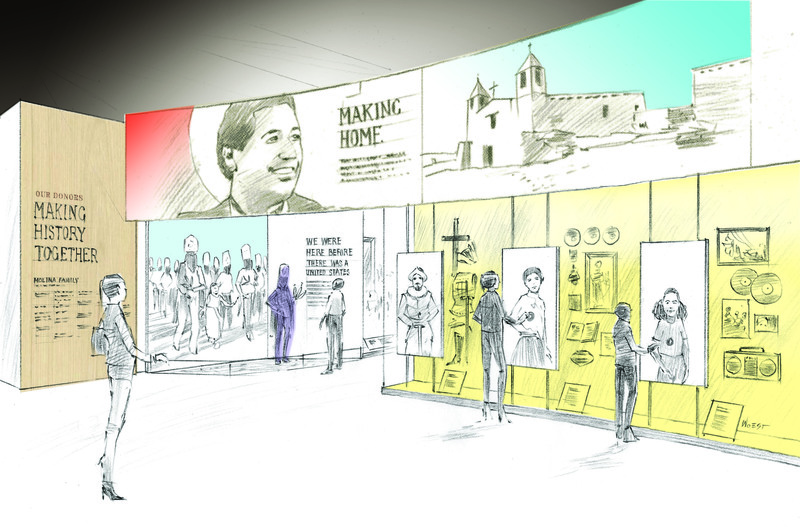 The Smithsonian Latino Center’s first gallery space, the Molina Family Latino Gallery, will be dedicated to celebrating the U.S. Latino experience and open at the Smithsonian’s National Museum of American History in 2021. The gallery, designed by Museum Environments/Branded Environments LLC, will feature 4,500 square feet of bilingual stories for all audiences. Rotating exhibitions featuring multimedia activities, objects and first-person narratives will be complemented by participatory experiences and viewer-generated content. The gallery space is made possible by a lead gift to the Smithsonian Latino Center of $10 million by five members of the Molina family. Five siblings collectively made this founding gift in memory of their father Dr. C. David Molina, a health-care leader in California who founded the publicly traded Fortune 500 company Molina Healthcare Inc. The Smithsonian Latino Center has named the new gallery space the Molina Family Latino Gallery in recognition of the donation. Since 1997, the Smithsonian Latino Center has worked collaboratively with the Smithsonian’s museums and research centers to ensure that contributions of the Latino community are recognized, preserved and celebrated throughout the Institution. The Molina Family Latino Gallery will be a space for audiences of all ages and backgrounds to find common ground, share intersecting experiences and present perspectives that are not bound by nationality. An introductory area will provide a framework for the history and concepts presented in the gallery’s rotating exhibitions. The planned inaugural exhibition, “Making Home: Latino Stories of Community and Belonging,” will examine the historical roots of Latino culture as it shaped the continent and the U.S. Visitors will also have the opportunity to extend their visit by engaging with active learning programs, which will offer flexible education and public programming through a variety of activity types and immersive digital experiences. The Smithsonian Latino Center’s forthcoming mobile site will also provide access to audiences across the nation. The gallery space is also made possible by Target, the first corporate founding donor to the Smithsonian Latino Center with a gift of $2 million. Target is a long-standing corporate donor to the Smithsonian with significant support given to arts and cultural initiatives. A gallery preview and gift-agreement signing ceremony will be held in the future gallery space at the National Museum of American History Dec. 6. The Smithsonian Latino Center serves as the corazón (heart) of Latinidad at the Smithsonian. Through its exhibits, initiatives and programs, it unlocks the dynamic Latino stories that shape national experience and identity in the U.S. In preserving and presenting these stories, the center empowers a greater understanding and deeper appreciation for the enduring contributions of Latinos to the country in a way that celebrates Latino presence in American history and culture, and convenes inclusive conversations about the stories that continue to inspire generations to come. For more information, visit www.latino.si.edu.